The author is an extension forage agronomist, University of Wisconsin, Madison. From the time forage is cut until it is fed, the goal is to minimize dry matter and forage quality loss. While all forage declines in dry matter and forage quality after cutting, the amount of decline is determined by the management strategies. One of the often overlooked sources of dry matter and forage quality loss is respiration after mowing. Respiration is the breaking down of starch and sugars to produce energy (heat) and carbon dioxide. The process occurs in growing plants and continues after mowing, even in baleage and silage when heat is produced. Data suggest that 2 to 8 percent of the dry matter may by lost due to respiration. 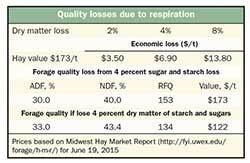 The table shows that, at current hay prices in the Midwest, a 4 percent dry matter loss results in a $6.90 loss per ton of hay. Losses are greatest in the West where forage is often cut with a large cutter bar and put into a windrow that fits between the swather tires. This hay often takes five to seven days to dry for baling, while some farmers of the same region put forage into a wide swath and bale it in two days. Not only does the faster drying time result in less dry matter loss, but getting the hay off the field faster results in less wheel traffic damage to regrowth and higher yield of next cutting. Respiration also causes a significant forage quality loss since lost starch and sugar are 100 percent digestible. As the table shows, loss of sugar and starch increases the content of remaining components. A 4 percent loss in starch and sugar would raise NDF (neutral detergent fiber) slightly over 3 percent. Note that this is a drop of almost 20 points of RFQ (relative forage quality). Thus, if one had cut alfalfa at just below 40 percent NDF and lost 4 percent sugar and starch, the harvested quality would be above 40 percent NDF, which is currently selling for about $50 per ton less. The first and largest good practice is to spread forage into a wide swath so that more sunlight is intercepted and stomates (breathing holes in the leaves) stay open to allow rapid drying of the leaves. The goal is to maximize the interface of sunlight to forage. Hay should be managed to dry, as quickly as possible, to 60 percent moisture or less on the day it is cut. When forage moisture falls below 60 percent, respiration is greatly reduced. Hay that is put immediately into a windrow dries slowly inside the windrow and has high respiration rates for an extended time. Thus, growers should spread cut hay into a wide swath (and drive over it) rather than to make a windrow that fits between the wheels. 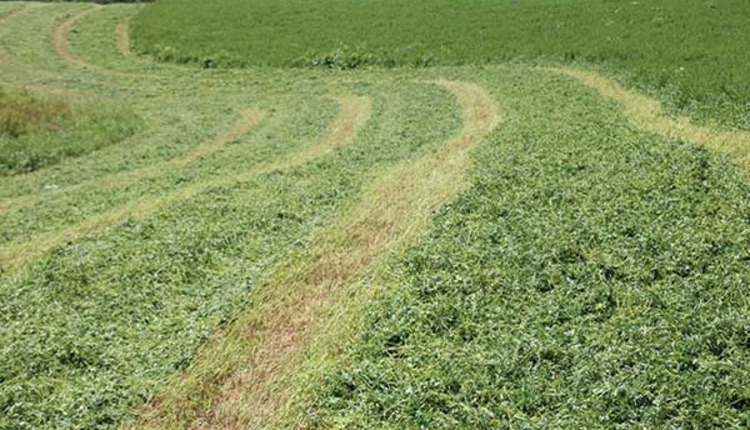 Note that if a grower insists on putting forage immediately into a windrow and taking the respiration losses of sugar and starch, then the forage must be cut earlier to be below 40 percent NDF (150 RFQ) at baling or chopping, if that is the goal. Cutting earlier to allow for the respiration losses means at least a 10 percent yield loss and greater stress on the stand, thereby shortening stand life. A second method to reduce respiration losses is to make haylage in a pile or bunker or to make and wrap bales in plastic. Respiration requires oxygen. If packed tightly, the forage respiration will quickly use up the oxygen, and respiration will stop. This practice is most effective reducing respiration losses if combined with forage put into a wide swath at cutting, dried quickly to 60 to 65 percent moisture and then ensiled or wrapped in a bale. This article appeared in the August/September issue of Hay & Forage Grower on page 12-13.